Lisbon meeting will be sixth in a series and will put together scientists from different backgrounds in order to facilitate translation of knowledge between chemistry and biology. The conference will be preceded by the Protein School that will cover topics under the scope of “Identification of Novel Target in Medicine and Biology – Applied Techniques”. (Free for PhD and early career Postdoctoral Fellows, limited to 50). 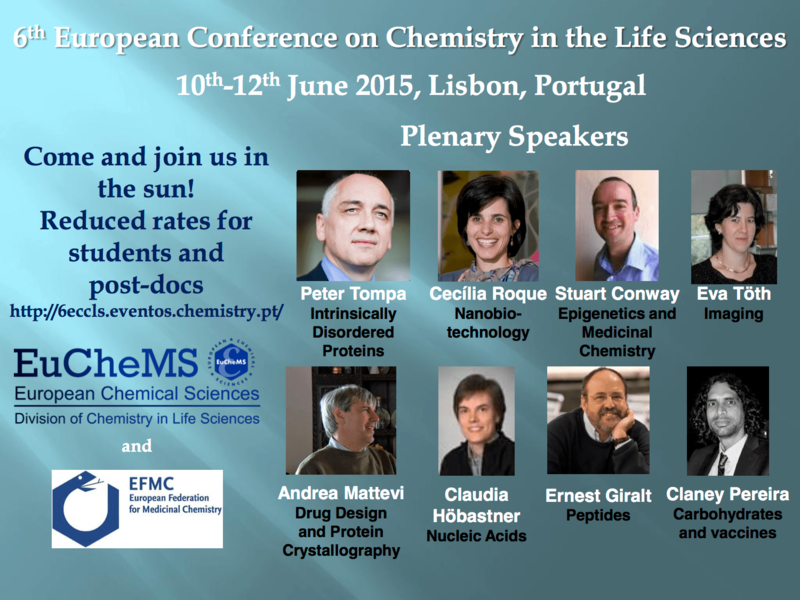 This conference is an activity of the EuCheMS (European Association for Chemical and Molecular Sciences) Division of Chemistry in Life Sciences, and cover topics not exclusively on Intrinsically disordered proteins, Nanobiotechnology and applications, Metabolomics, Drug-design and nanomedicine, Membrane proteins and receptors, Imaging, Carbohydrates and applications, Nucleic Acids ­ folding, structure and functions, Chemical modification of proteins, In silico and molecular modeling.